When it comes to choice and value in 9 seat wheelchair accessible minibuses for sale we believe we can't be beaten. With excellent purchase terms with most mainstream manufacturers we can provide bespoke conversions to mainstream minibuses and manufacture fully custom-built wheelchair minibuses from any donor van. From your initial contact we'll work hard to understand your needs and provide best advice to get you the most suitable and best value minibus for your particular needs. We go the extra distance and also have a nationwide delivery service with professional delivery drivers so you don't have to. Use our text search box and advanced search options to the left to narrow down your search or follow the links to see all our used 9 seat minibuses for sale, new 9 seat minibuses for sale or all our new and used wheelchair accessible minibuses for sale. 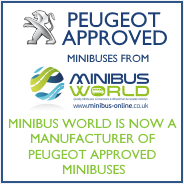 We also have a great range of non-adapted / fixed seat minibuses. If you're not looking to purchase outright, you may want to find out more about and look at our great minibus leasing deals. And if all these options are a bit much to take in, you can always pick up the phone to discuss your requirements. Please call a member of our friendly sales team on 01782 444 289.